James Ennis, who has been out since April 3 with a right quad contusion, was cleared to play in Game 2 on Monday. 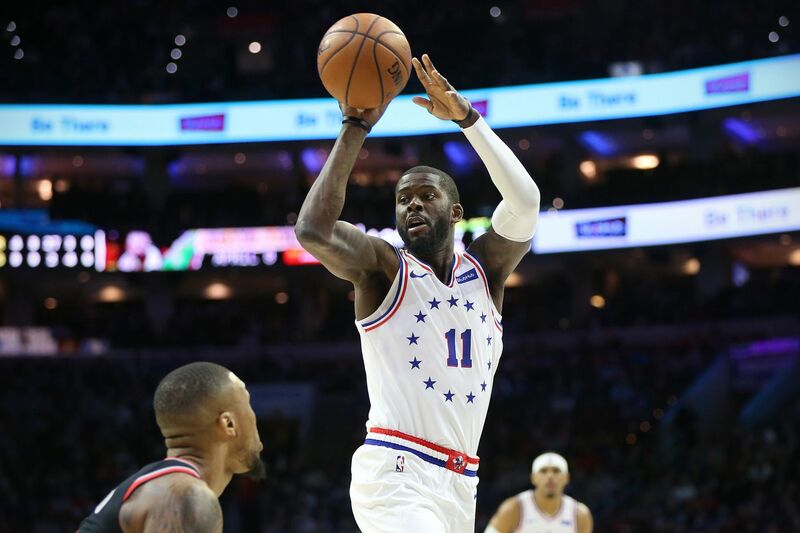 The 76ers got some positive news concerning reserve forward James Ennis when he was cleared to play for the first time since suffering a right quad contusion in an April 3 game at Atlanta. At the time, the Sixers said that Ennis would be evaluated in two weeks, but the evaluation came a little sooner on Monday. During his pregame press conference, before Ennis’ status was known, Sixers coach Brett Brown said the 6-foot-7 forward would be able to go about 12 minutes. It turns out he played 12 minutes and 2 seconds and scored six points. “We need a shot maker offensively, the ability to make a three and defensively, the ability to keep somebody in front of him," Brown said. The Nets seemingly had a free reign to the basket in their 111-102 win in Game 1. Ennis, who was acquired at the trade deadline from Houston, appeared in 18 regular-season games for the Sixers, including two starts and averaged 5.3 points in 15.6 minutes. He entered Monday’s game for the first time with 5 minutes and 31 seconds left in the first quarter. The Nets played without Jared Dudley, who missed the game with right calf tightness. Dudley was an integral part of the Game 1 win, guarding the likes of Ben Simmons and 7-foot-3 Boban Marjanovic. In 27:52 of playing time, the 6-7 Dudley scored four points, had four assists, no turnovers, and more impressively was a plus-16. Center Ed Davis, who was a plus-28 in Game 1, but suffered a sprained right ankle, was available for the Nets. Nets coach Kenny Atkinson couldn’t be more candid when asked pregame if he would continue to sag off Joel Embiid and Ben Simmons until they both proved they could beat Brooklyn from the outside. Atkinson said he would also have to be ready to adjust if the Sixers made him pay for this defensive strategy. Sixers guard JJ Redick is appearing in the postseason for a 13th consecutive year. That is the longest active streak in the NBA, according to the Elias Sports Bureau. Game 3 is 8 p.m. Thursday at the Barclays Center.